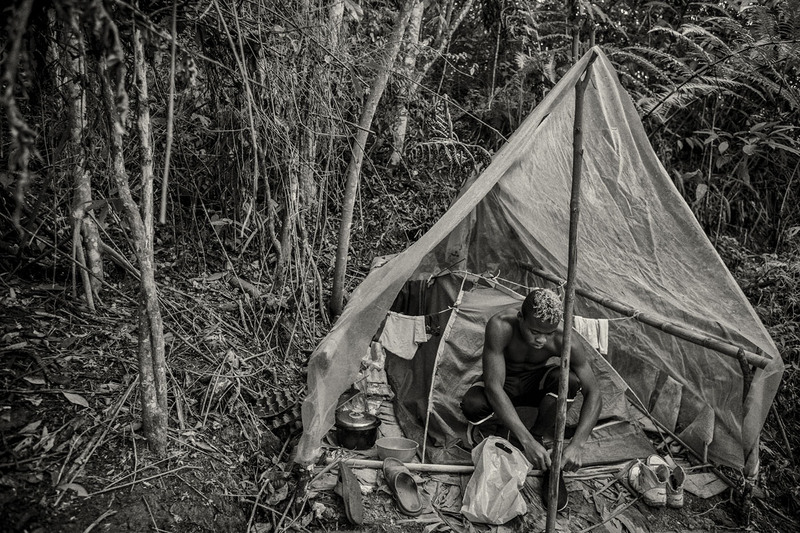 Juan looks at the challenges faced by ex-combatants transitioning back to civilian life in Colombia, as the nation prepares for a historic peace agreement between the government and FARC in March, 2016.
for a picture at their camp. The Che Guevara front operates on the Pacific coast of Colombia patrolling important corridors to allow the export of cocaine to the Pacific Ocean and into Mexico. Chocó, Colombia. Members of the ELN (Ejercito de Liberación Nacional) take formation at their camp. The Che Guevara front operates on the Pacific coast of Colombia patrolling important corridors to allow the export of cocaine to the Pacific Ocean and into Mexico. Chocó, Colombia. 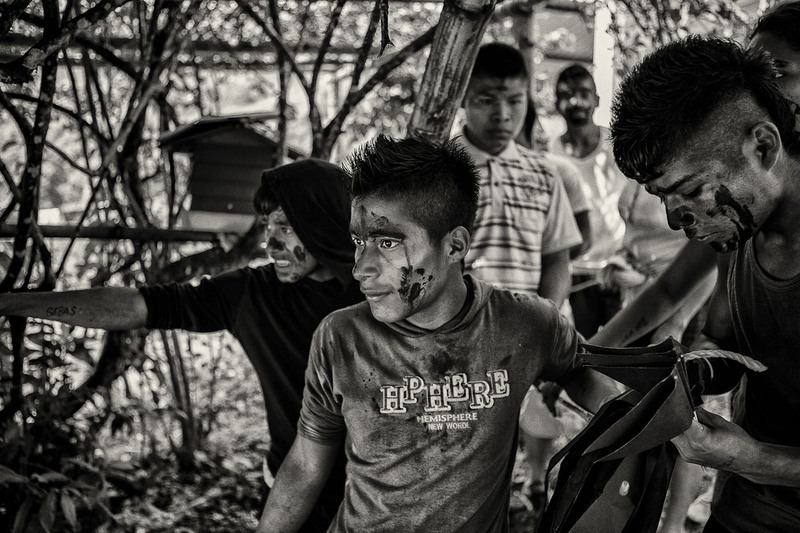 Roberto (18) lives in a makeshift camp in the outskirts of Riosucio. After leaving a rehabilitation center for former combatants, Roberto returned to his community only to be threatened by the ELN. Riosucio, Colombia. 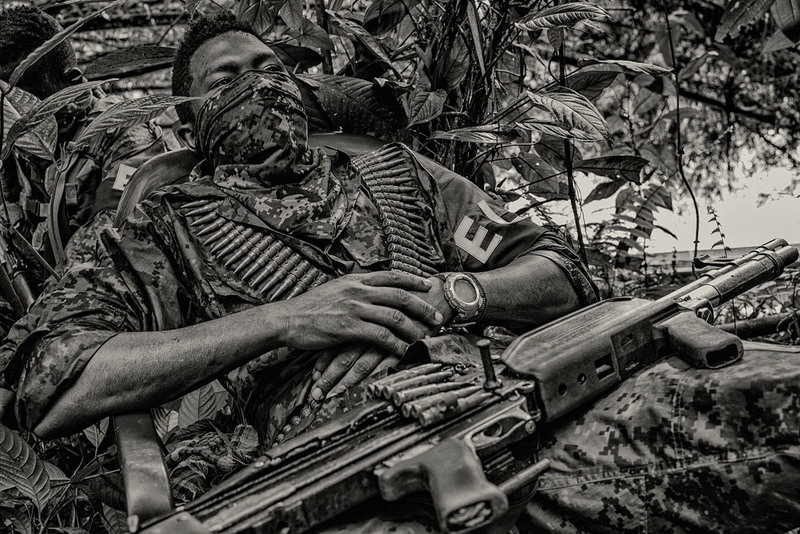 Camilo (17) a members of the ELN front Che Guevara, takes a rest after morning drills at their camp in Chocó, Colombia. The Che Guevara front operates on the Pacific coast of Colombia patrolling important corridors to allow the export of cocaine to the Pacific Ocean and into Mexico. Chocó, Colombia. 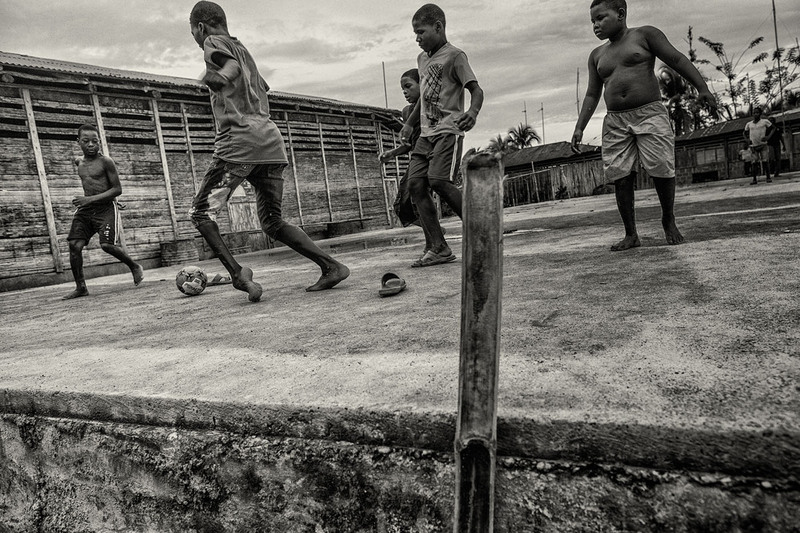 A group of children play soccer of the neighborhood of San Francisco in Buenaventura. Buenaventura is Colombia´s largest port and one of the areas most contested by the FARC and emerging paramilitary groups. These groups seek neighborhoods like San Francisco to recruit adolescents. The Wouana Indigenous community in Macedonia municipality of Noanamá. The community has been neglected by the state. In recent months, armed groups have made their presence in the area, recruiting young men and women in exchange for food security and protection. Noanamá, Chocó. A group of young men conform the Indigenous Guard of the Awá. 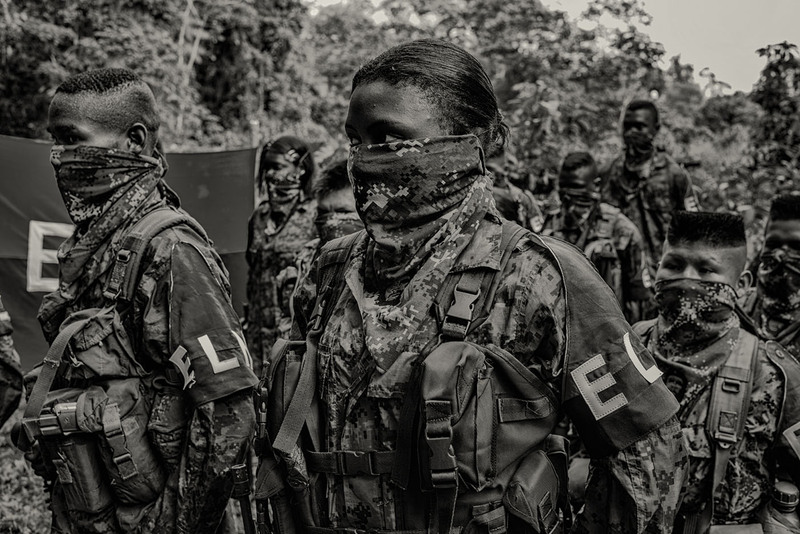 The guard has become the symbol of resistance among indigenous communities against the invasion and violence of armed groups in their territories. El Diviso, Nariño. 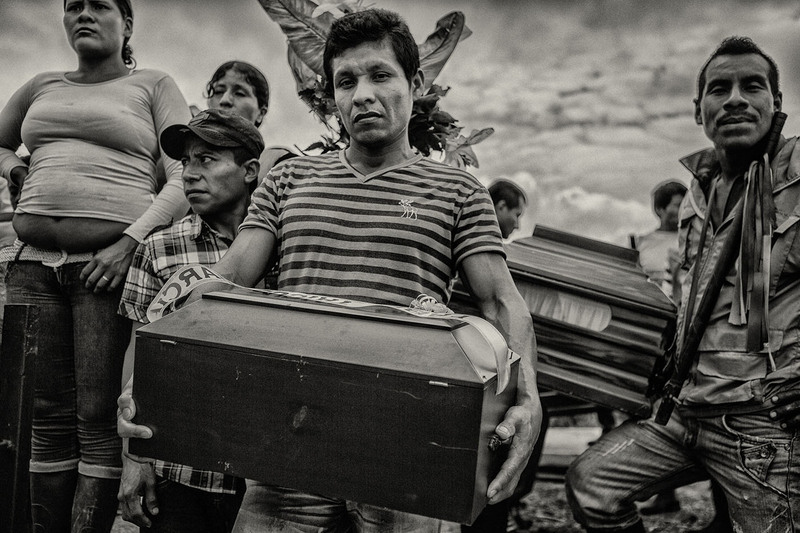 The indigenous community of Tortugaña Telembi make their way through the mountains to bury the bodies of 11 of their members that were killed by the 46th front of the FARC accused of adding the Colombian Army including two young boys who deserted the group. Bellavista, Nariño. 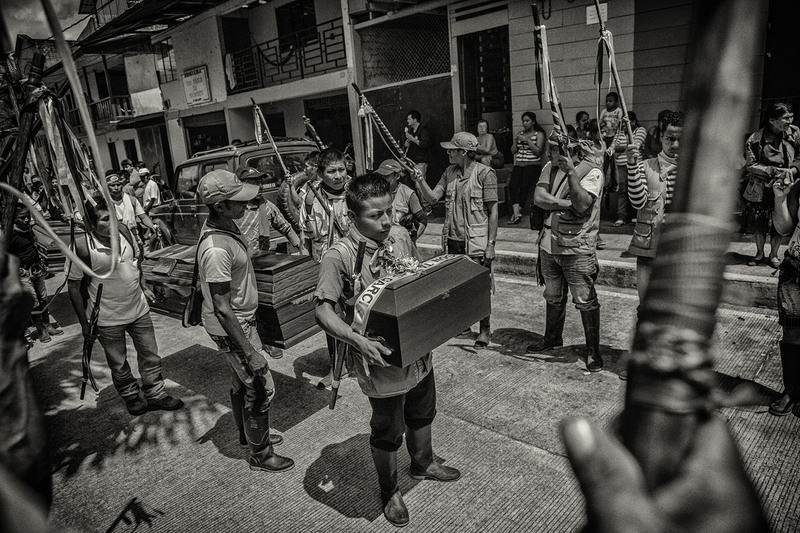 A father holds the coffin containing the remains of his son who was killed by the 46th front of the FARC accused of adding the Colombian Army and deserting the group. Bellavista, Nariño. Maritza, Dalia y María walk along the main road that leads to the attention center for demobilized child soldiers where they are thought agriculture related disciplines to prepared them to return to their home communities. Caldas, Colombia. 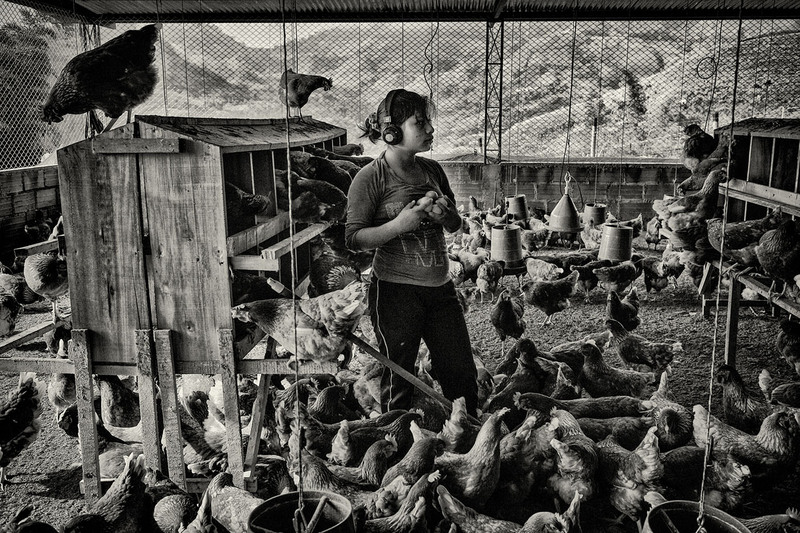 Cecilia (16) gathers eggs at a chicken farm as part of educational training for demobilized child soldiers. The training aims to prepared former child soldiers to their return to their communities and bring new farming ideas to those communities. Caldas, Colombia. Emilio cuts the hair for his friend at one of the dorms at an attention center for demobilized child soldiers. The center currently assists 40 demobilized child soldiers from around the country ranging from the ages of 13 to 18 years old. Caldas, Colombia. A group of boys play a game of finding clues as part of team building games at an attention center for former child soldiers. The center currently assists 40 demobilized child soldiers from around the country ranging from the ages of 13 to 18 years old. Caldas, Colombia. Julian (16) displays his tattoos on his arm. The tattoos were made while he was Guerrilla fighter in the FARC. 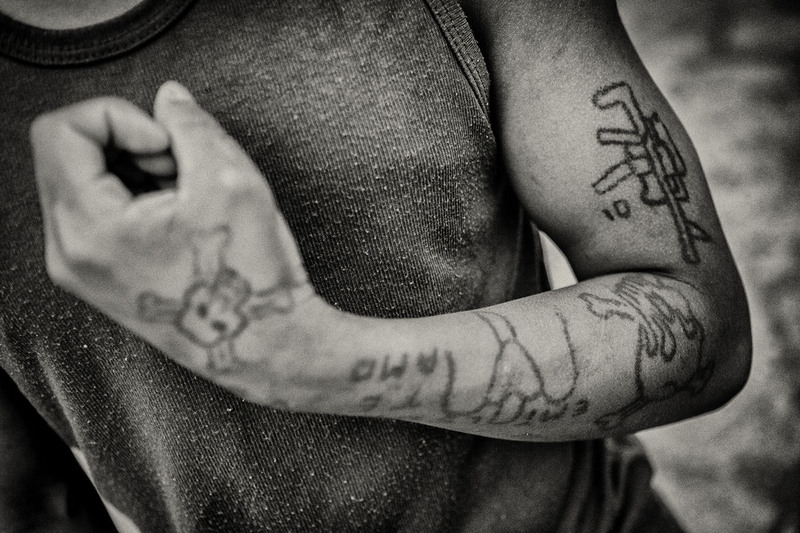 Tattoo’s have different representations for the combatants and is a way to find an identity in the armed group. Fabian is placed in a Cepo or indigenous cell for aggravating a staff member at a detection center. Fabian was recruited at the age of 8 yeas old by the FARC and felt in combat at the age of 17. He currently waits to be transfer to detention center. 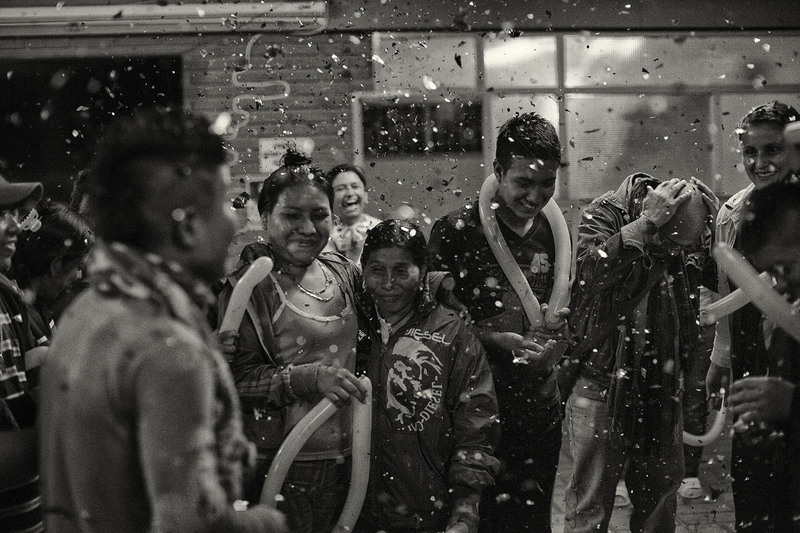 A welcome party is given to families of a group of children at an attention center for former child soldiers. For the children it is the first time to meet their families after an illegal armed group recruited them. Riosucio, Colombia. Robinson (15) takes part of a group prayer before supper at an attention center for demobilized child soldiers. Cali, Colombia. Bryan David (Left), Stevenson (middle) and Fabian (right) at an ice cream store after a day of field trip to the city of Manizales. 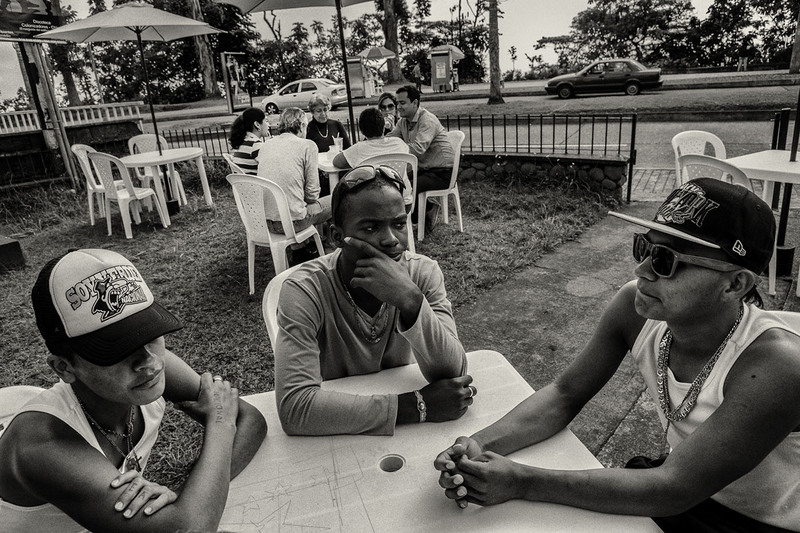 The three Young reside at an attention center for former child soldiers. Manizales, Colombia. 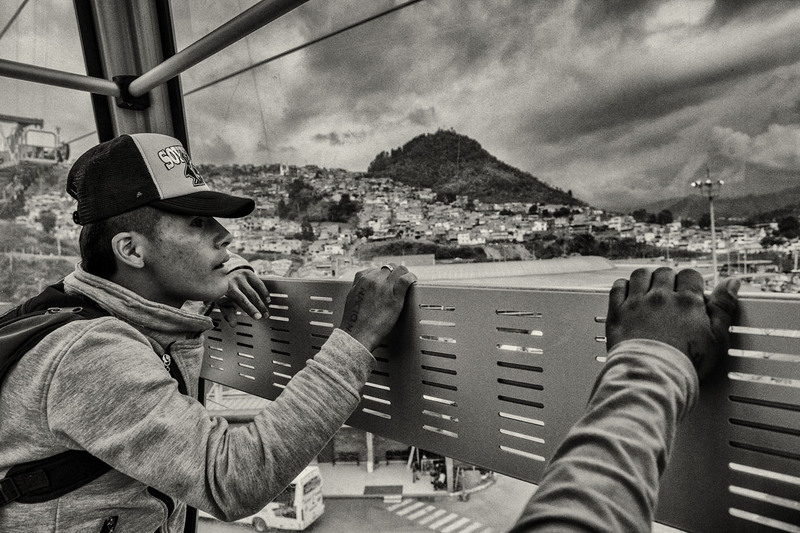 Bryan David (17) rides a cable cart for the first time in the city of Manizales. Bryan David was recruited at the age of 12 by the FARC and was capture in combat by the Colombian Army at the age of 16. He is currently living with a foster family in the city of Manizales, Colombia. Rubertino and his girlfriend meet a a park in Manizales. They both met at an attention center for demobilized child soldiers. Rubertino was recruited at the age of 12 by the ELN and is waiting a job placement to start his life as a civilian. Saakhelu Kiwe Kame a mayor ancestral ceremony performed by NASA Indigenous community in the ancestral grounds of Corinto, Cauca. 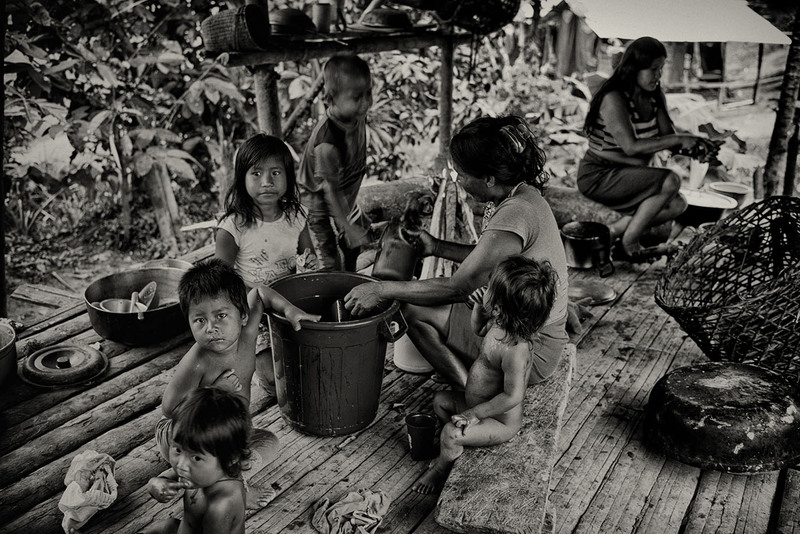 The NASA indigenous community is the most affected in Colombia by forced recruitment of minors. 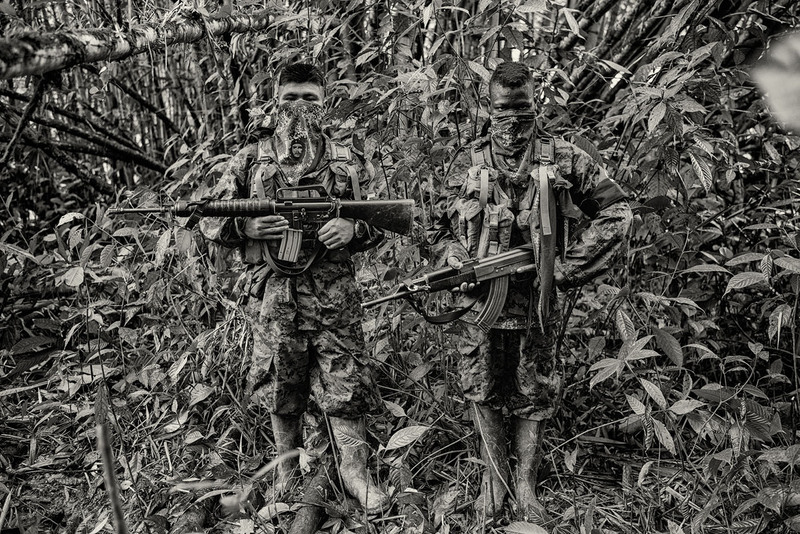 The state of Cauca is one of the last strong holds of FARC and one in which they heavily recruit teenagers as local militias or guerrilla fighters. 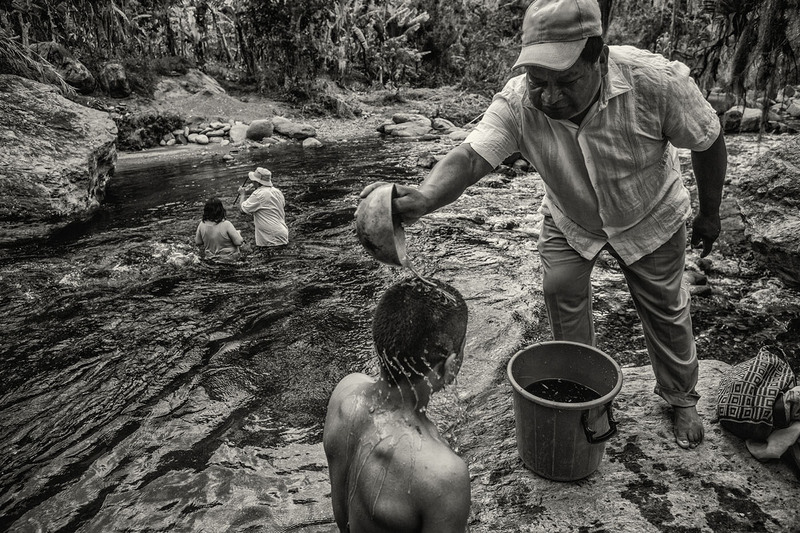 Jaime (14) receives a cleansing bath by one of the NASA community elders before entering the river Isabelilla to be cleansed by the NASA indigenous spiritual doctor as part of a ceremony to begin the process of healing and accepted by the community. Jaime was recruited early this year by the FARC; he was recovered by the NASA community after confronting the FARC leader who recruited him. Toribio, Cauca. Blanca Piaguaje remembers recalls the death of her husband at the hands of the FARC. Her youngest son was later recruited by the same group at the age of 13. 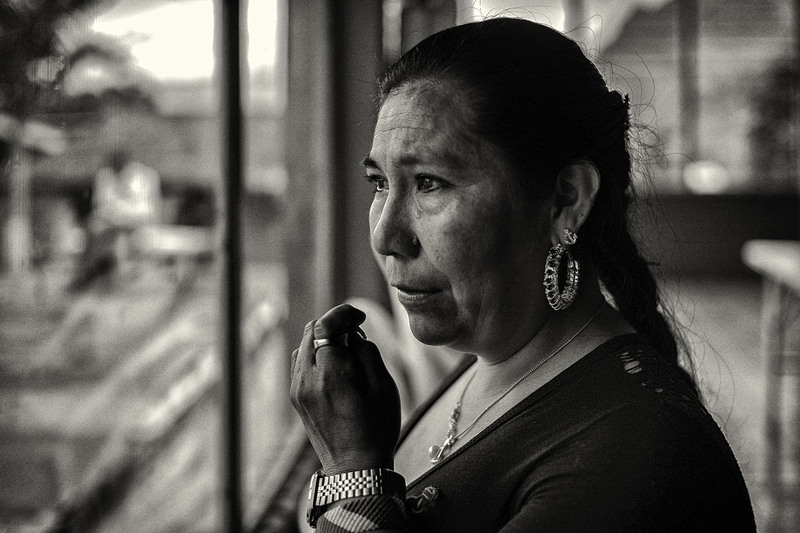 Blanca awaits the discharged of her son from an attention center for former combatants to relocate to Ecuador. Putumayo, Colombia. 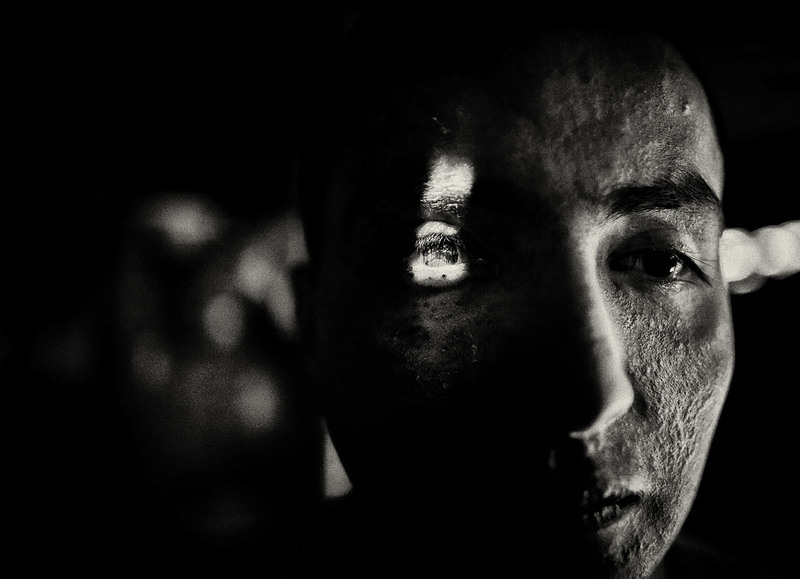 Cristian (19) lost his vision while in combat after a fellow combatant stepped on a land mine. Cristian was part of an intelligence gathering squad for the FARC. Samaniego, Nariño. 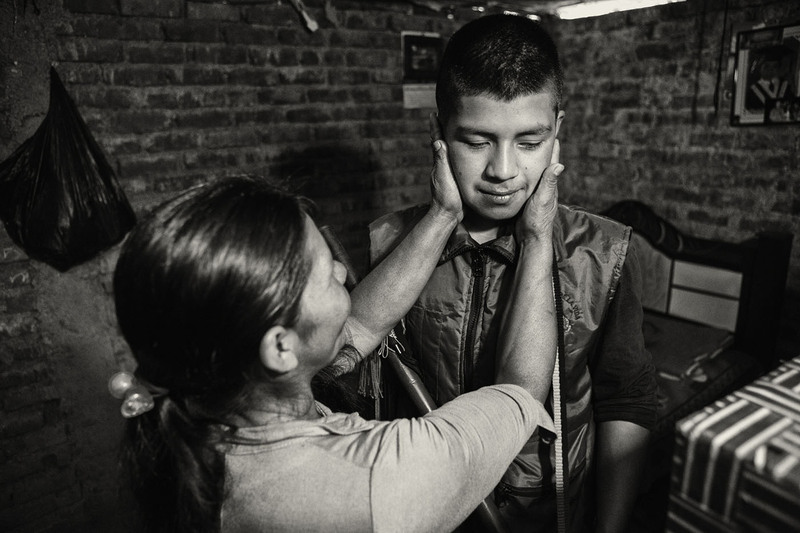 Jaime (14) with his mother at their house before attending a cleansing ceremony by the NASA indigenous spiritual doctor as part of a ceremony to begin the process of healing and accepted by the community. Jaime was recruited early this year by the FARC, he was recovered by the NASA community after confronting the FARC leader who recruited him. Toribio, Cauca. 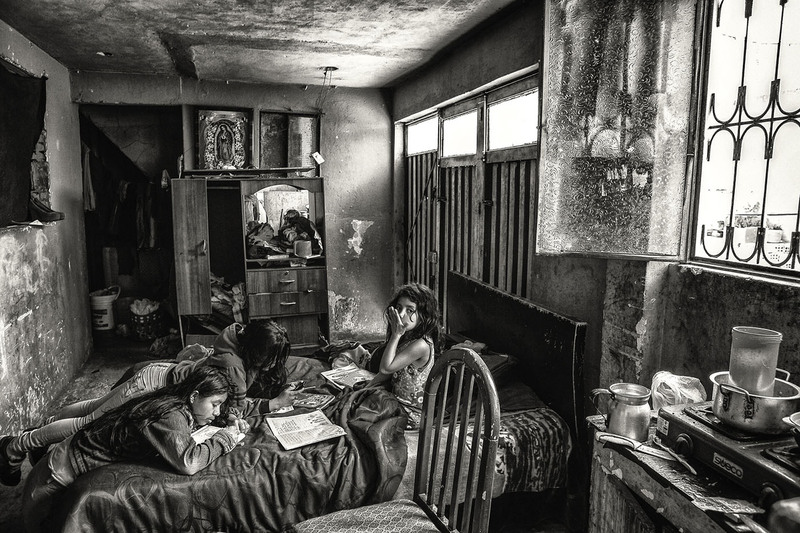 Angela and her sisters do homework at their rented apartement for eleven people in Soacha, Bogotá. Angela and her sister are part of a family who their father, mother and brother Edinson were also members of the FARC, his family has taken part of government program for demobilized guerrilla fighters. 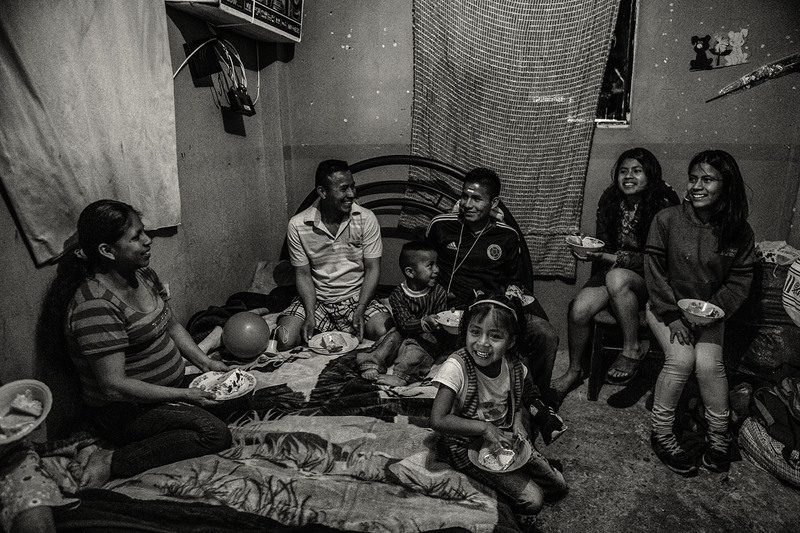 Edinson celebrates his 17 birthday with his family at their home in Bogota. Edinson was recruited at the age of 11 by the FARC. His father, mother and two sisters were also members of the FARC, their family has taken part of government program for demobilized guerrilla fighters. 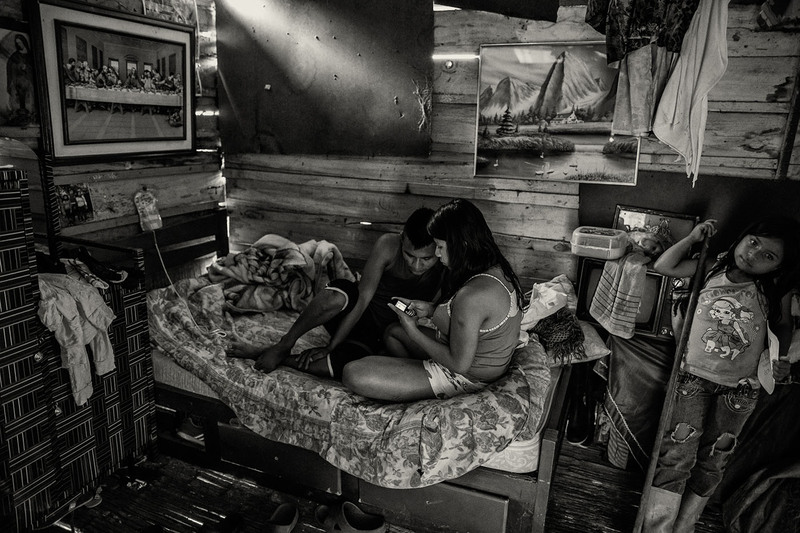 Fabio Chipacue (18) with his pregnant girlfriend Marcela (17) playing video game of their cellphone. Fabio who was recruited at the age of seven by the FARC, had his first combat experience at eleven, and was captured at fifteen. Now at eighteen, Fabio has no family to return to and now his is starting his own. Riocusio, Colombia. 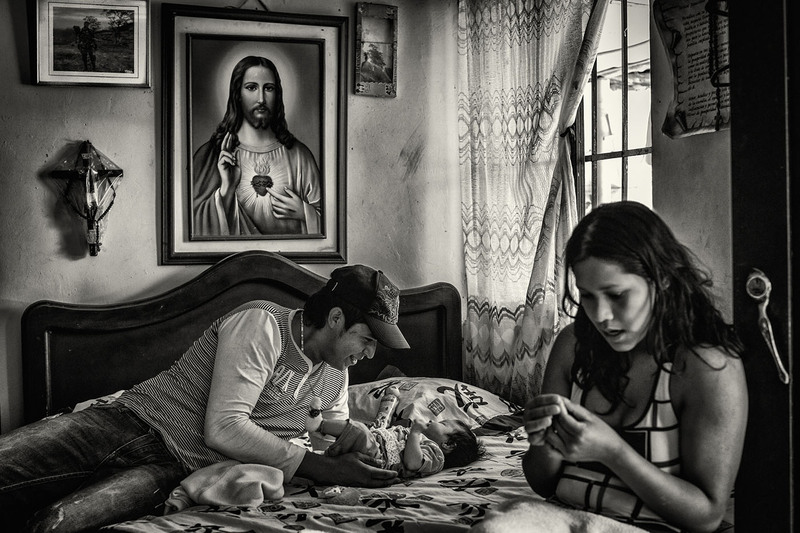 Javier (21) with his daughter Celeste and his partner Melida Ortiz (18). Melida was recruited at nine years old by the FARC then became the personal assistant and mistress to ‘Rumaña’ –a FARC top commander-. Javier brother was killed in combat. Her partner Javier who’s brother a soldier, was killed in combat by the FARC but has been able to forgive the past and start a family with former FARC fighter. Melida (Left, 18) with her daughter Celeste and her friends Deyanira (right, 19) who they met at an attention center for former combatants. Deyanira was recruited at 13 years by the FARC and at the 16 was order to place an explosive at army base in Cauca. She deserted after not being able to carry out the attack. Now she cannot return to her family as FARC continues to look for her. 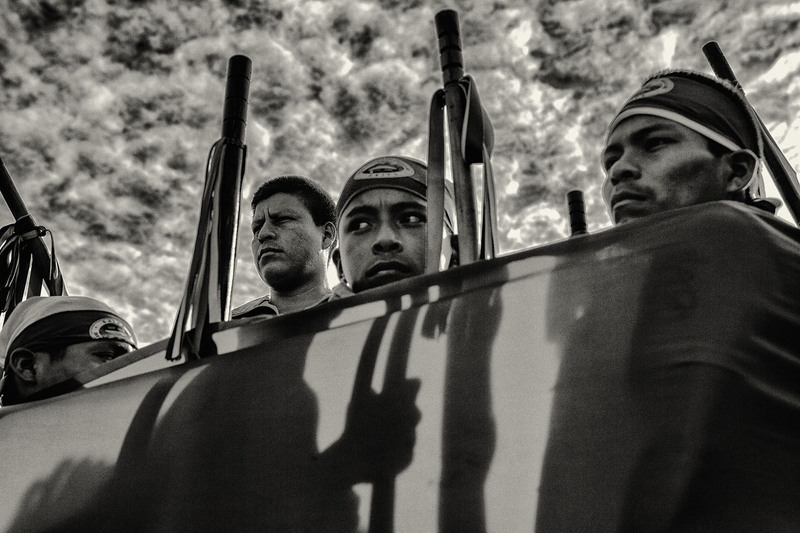 My story documents the lives of child soldiers in Colombia. I will explore the challenges these ex-combatants face to transition into civilian a life in a society that is prejudiced against them and a country that must reconcile its past as it prepares for a peace agreement between the Colombian government and FARC in March of 2016. 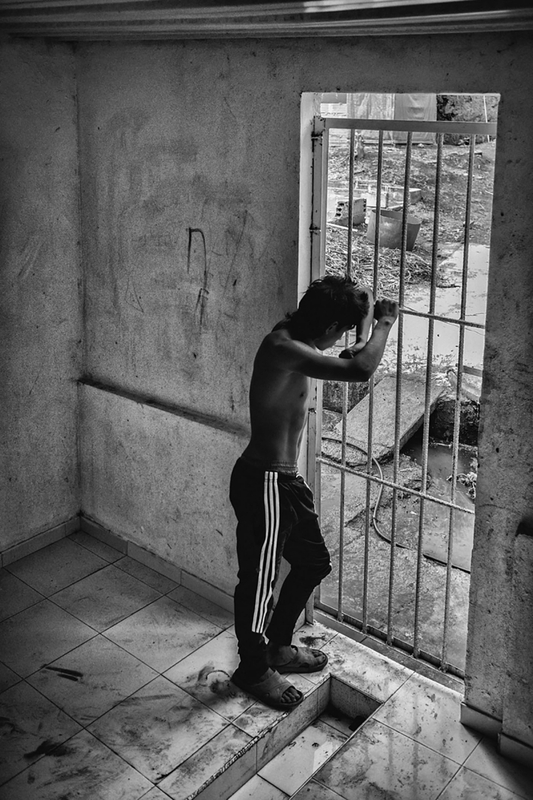 For the past six years, I have been documenting the hope, uncertainty and struggles of families in search of loved ones who have been kidnapped, displaced, or disappeared in Colombia’s civil war. This is a conflict with a complex history of insurgency, drug trafficking, and violence that spans more than five decades and has claimed the lives of a quarter million Colombians. 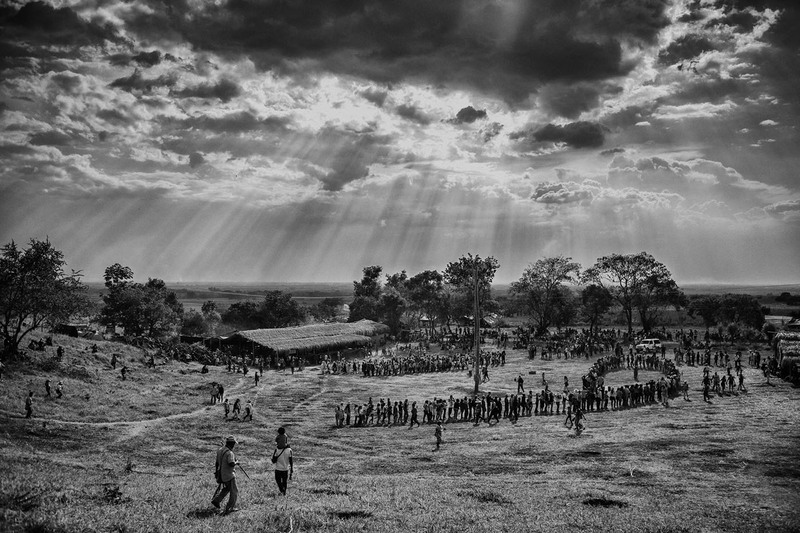 However, after all these years of documenting this protracted conflict nothing had prepared me for what I came across the afternoon of February 2014; twenty-five heavily-armed teenagers who greeted our ICRC convoy in the middle of the jungle. They formed the Che Guevara front of the ELN (the National Liberation Army). Since that unforeseen encounter, I have intentionallly met with current and former child soldiers throughout the country. In this quest, I have come across a silenced latent crisis that has devastated the lives of thousands of innocent children and their families. These young survivors are faced with the hardship of returning to families who are living in extreme poverty, or to communities that shun them—or both. 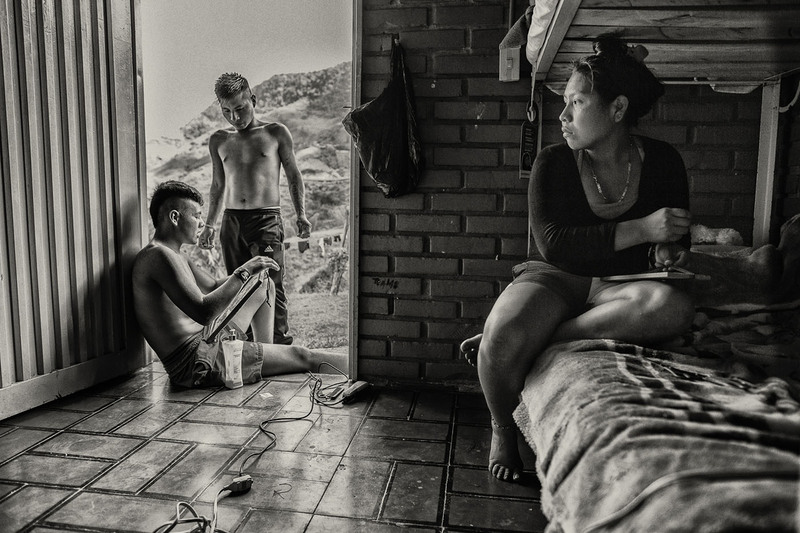 Moreover, they are stigmatized by the collective fear of Colombian society at large, which views them as criminals, hence facing economic instability because of discrimination, lack of education and little family support. As a result, most of these children are forced to enter a cycle of violence and criminality that perpetuates this social conflict. My goal is to cover as many testimonies of child soldiers as possible to humanize these young combatants and allow the general public to have open and informed conversations with less biased pre-conceptions. Through these stories, I will expose the challenges these ex- combatants face as they rebuild their lives outside the theater of war in a country transitioning into a post-conflict era. This undocumented aspect of the conflict will also serve as a litmus test of Colombia’s ability to embrace these young ex-combatants as an exercise of reconciliation and forgiveness. I strongly believe what Colombia needs now more than ever is reconciliation among its own citizens. Decades of internal conflict, four failed peace agreements and countless victims have left a nation divided. Emotions run high as to whether Colombians should give these ex-combats a second chance. A recent poll taken in all major cities indicates that 56% of the population would not accept an ex-guerrilla fighter as aneighbor. Therefore, my work will provide a tool to steer the conversation towards a more positive and proactive end. Many long-term stories have covered five decades of internal conflict but none has uncovered this hidden crisis. In addition, as a peace agreement is being drafted, there has been no acknowledgment of the recruitment of child soldiers by the FARC or ELN; nor has the government or the international community demanded the hand-over of close to 7,000 children currently enlisted in the ranks of armed groups. Meanwhile, the groups continue to recruit and conscript more children. It is my belief that photographs conceived as instruments of representation and preservation of historical memory could bring change and help restore the identity, stability and dignity of children caught in the middle this war. Through a series of exhibitions and seminars across the country, I hope to bring Colombians to see these children for who they are: children. My intent is not to provide justification for their actions as combatants, but rather present their stories as intimately as possible in order to encourage an open conversation among citizens while advance the national dialogue towards peaceful country. 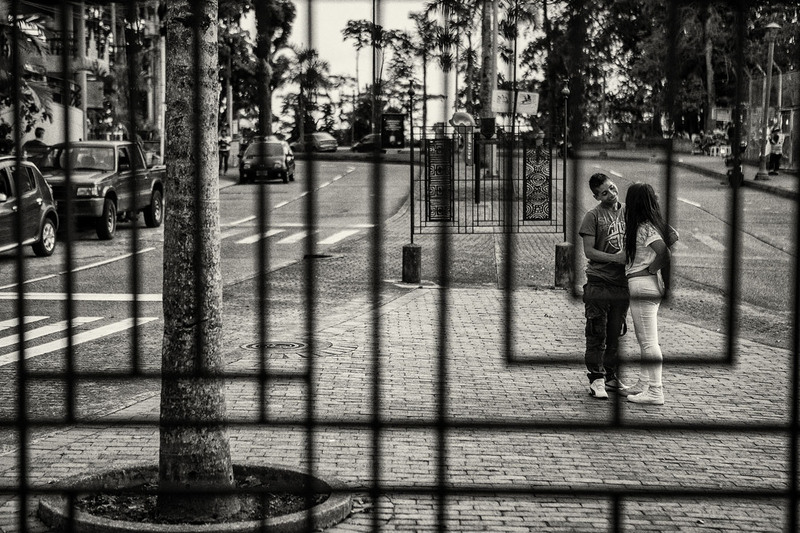 Juan Arredondo is a Colombian-American photographer whose images explore social inequality and human-right issues. 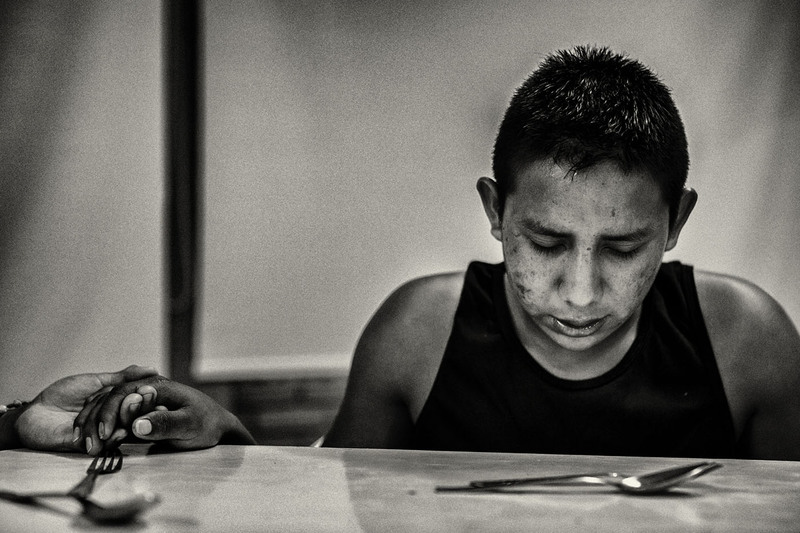 Juan interned for photographers Eugene Richards and Lori Grinker, and held a teacher assistant position at ICP (International Center of Photography) in New York City. 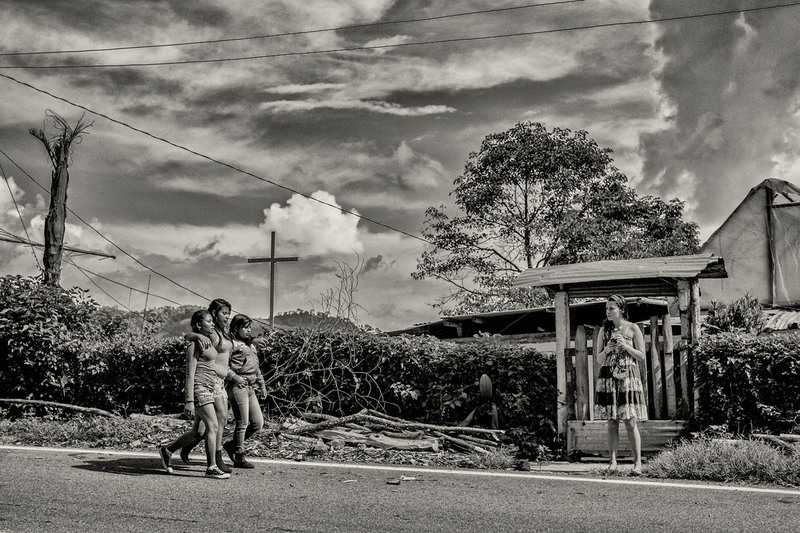 That same year Juan began to travel to Colombia to photograph that country’s protracted conflict. Juan is a regular contributor for The New York Times. His photographs have been featured in The Wall Street Journal, Newsweek, LeMonde Magazine, Der Spiegel, Daily Mail, Internazionale, VICE among others. His work has been commissioned by International Committee of the Red Cross (ICRC), UNHCR, International Rescue Committee (IRC) and Save the Children.